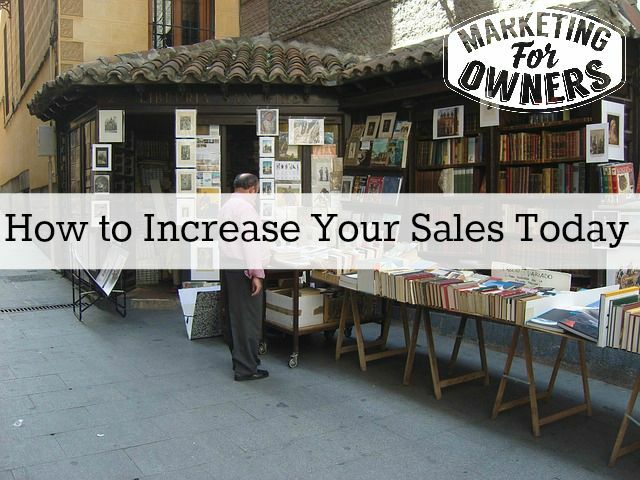 Today I am going to tell you how you can improve your sales! That means right now. So this is a weekend challenge, my friends. Get that pad, get a pen or a pencil and write these down. Just don’t do this electronically. Number 1. To get more sales. When was the last time you got on the phone? I want you to make some phone calls. This is the hardest thing, but you know full well if you stand in front of a customer, you can do it. 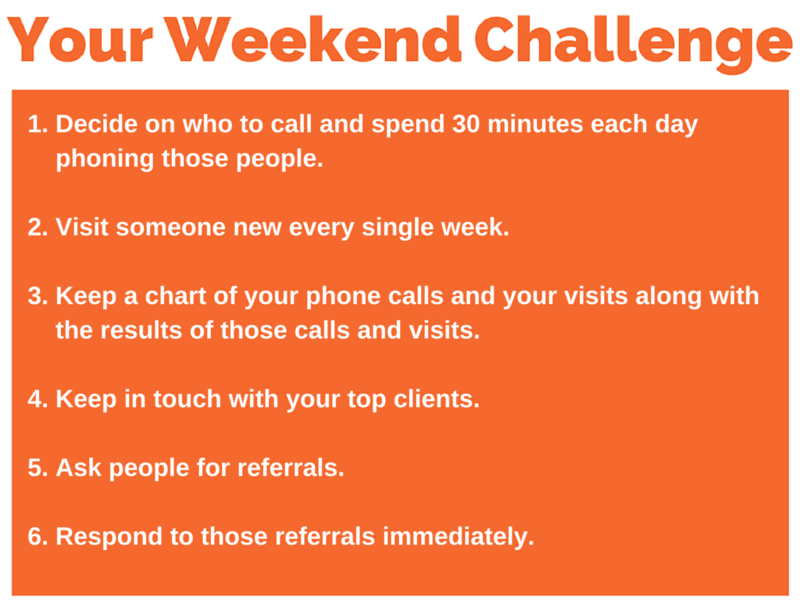 Decide who you are going to phone and spend 30 minutes of each day phoning people. It doesn’t necessarily have to be you. You could designate someone who might be good at it. Design a script for that person and then test it out. Speak to them. When you speak to people, ask them questions. Don’t try to sell them anything. Take a survey and say something like, “I’m just calling because I wanted to ask you a couple of quick questions because we’re building a little survey. Do you mind answering a couple? Can you tell me…” and find out what works. Use it. Don’t give me the excuses that you can’t get anymore sales. Number 2. Visit people every week. I mean, not the same people. Visit somebody every single week. Quite often as bosses, we sit and we don’t go anywhere. We don’t visit anyone. We don’t do anything. We don’t do anything like that. Visit people! Again, remember, this is because you don’t have enough sales, so don’t give me the excuse you don’t know how to do it because I’ve just given you two. Number 3. Keep a chart of your results. Write down how many phone calls you have made, how many appointments you got from those phone calls because that’s really what your going to try and get is appointments to go and see people, and then you can sell them face to face. Keep a chart, and you’ll know how you’re performing going against previous attempts and if you’re getting better and better or if you’re getting worse. Number 4. Keep in touch with your top clients. This is a biggie. You’ve probably heard before it is much easier to sell again to somebody than to get a new customer. Those top clients will buy off you again and again and again, so keep in touch with them. Ask them questions, tell them how wonderful they are, ask for their advice about whatever they do. Things like that. Number 5. 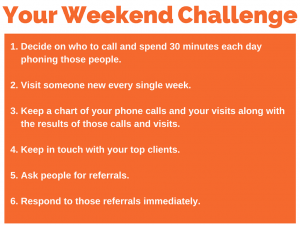 Ask people for referrals. Now this doesn’t matter whether it’s current customers or old ones. It could be ones that you’ve just sold to or ones that have been customers for ages that you sold to a while ago. Get in touch with them and ask them for referrals. Go back to, I think it’s episodes 92 to 96 where I give you a whole week’s worth of information on how to get referrals. Again, don’t give me excuses that you don’t know how to get any sales because I’m telling you right now stuff you could do today to get an order today! All right. When you get a lead, when someone makes an inquiry, make it your absolute aim to get back in touch with them as soon as possible and to keep in touch with them again and again. Follow up often. Don’t just get in touch once. Keep on at them. Now, you think, “Oh, but they don’t want anything.” What’s the harm? What can they do? They can say, “Yes, I do want to know more from you or I do want to buy something” or “No, I’m not interested.” Keep on getting in touch with them, following up with them until they tell you they’re not interested. When they say they’re not interested, ask them why. That was another weekend challenge. I’ll chat with you again on Monday! Which of these will you start on this weekend?